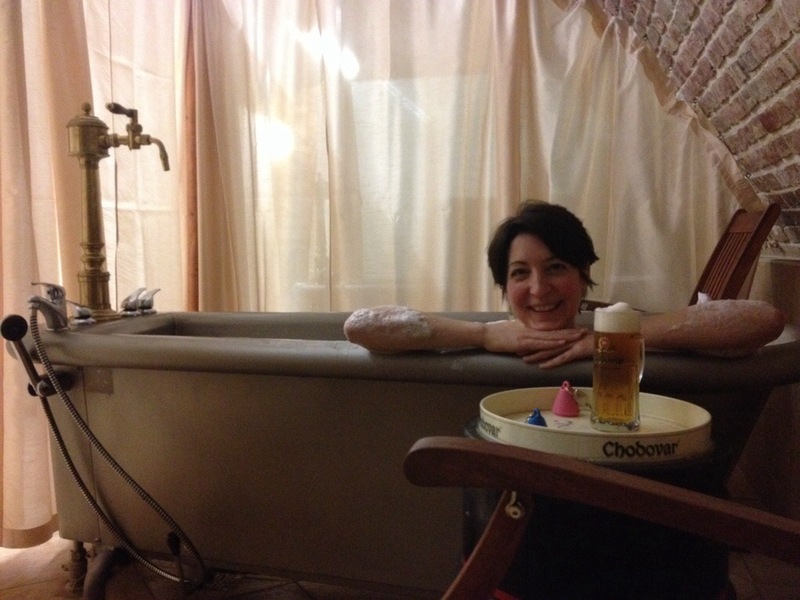 Is it wise to put a photo of oneself in a tub, with a beer, on the Internet? Probably not. 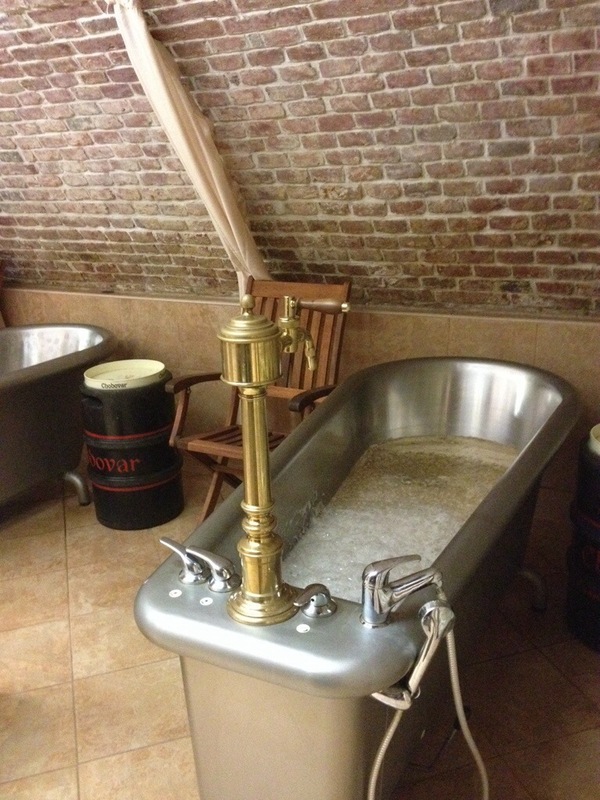 But this is no ordinary tub- this is a beer spa! And it’s important to see what is not in this picture: no neon, no logos, nothing loud or tacky. Just a cave, a simple tub, and a beer. 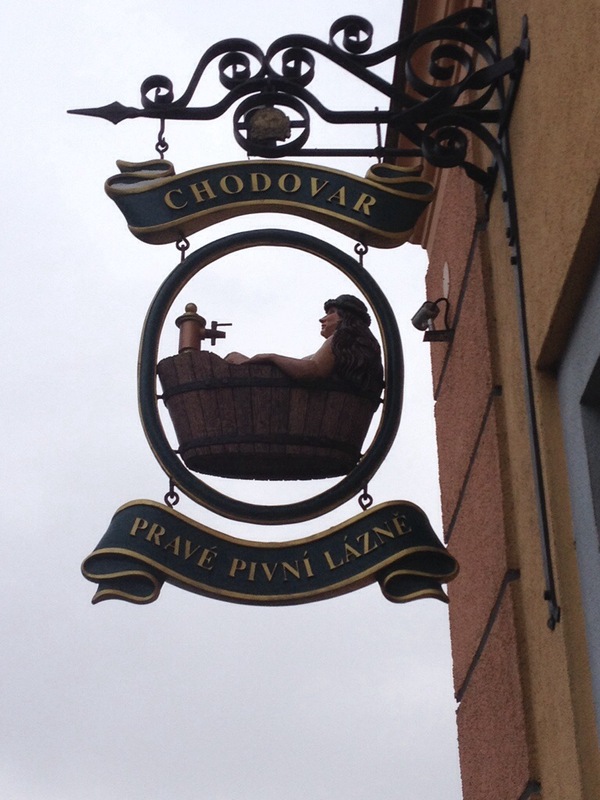 Welcome to Chodovar (pronounced hoe-da-var, as far as I can tell) – a beer wellness center about two hours southeast of Prague close to the German border. 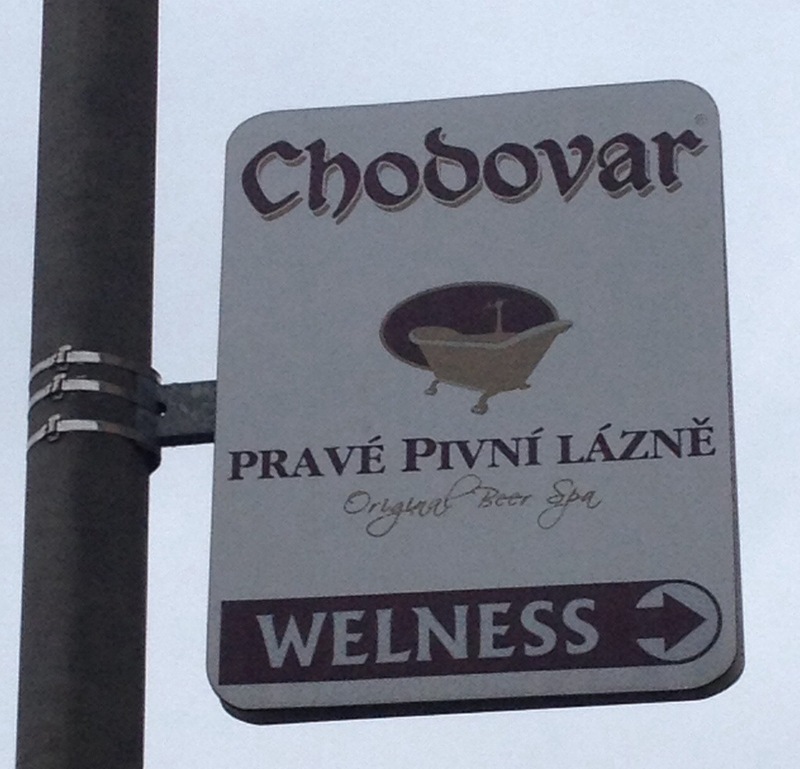 Or, as they call it, “Your Beer Wellness Land.” It is made up of the brewery, a hotel (Hotel U Sládka), a restaurant (Ve Skále), and the spa (pravé Pivní lázně). I’m not really a spa person. My company sends me to nice hotels- I always use the “spa” time looking for craft beer. But compared to standing in endless beer fest lines, (even if they are in Osaka, Rome, or Brussels) or trekking hours into the woods on dirt roads to obtain rare beers, this is a TRUE beer experience. Here’s how it works. 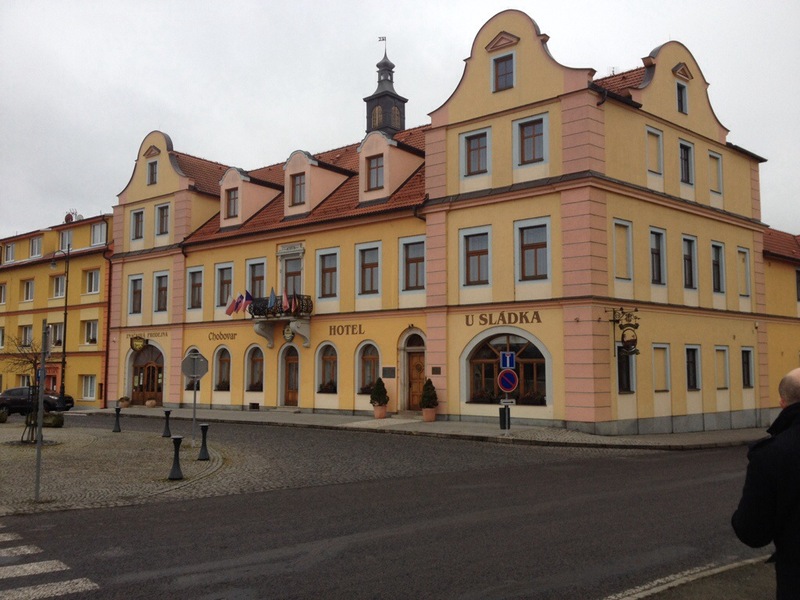 Take a train from Prague, where you’ve already got an inexpensive apartment to use as a home base. (See forthcoming post.) Change trains in Plzen and enjoy the tank-quality Pilsner (Gambrinus 10) while waiting 30 minutes for another train to Chadová. Walk a half mile to the Land. Check into the hotel. Five minutes before your reserved spa time (you may also reserve massage, foot treatment, facial, and other more hands-on-you events) return to the reception desk where they wave you down some stairs. 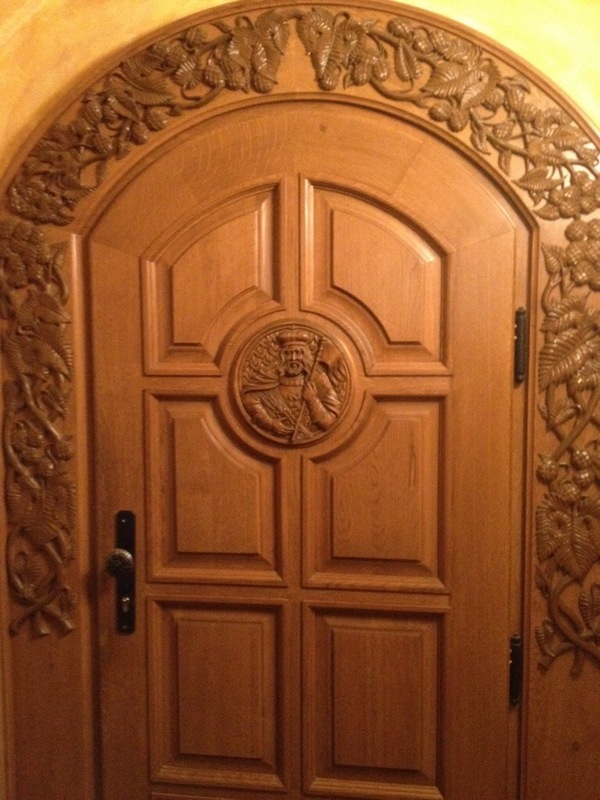 You will face a door covered in carved hops- it’s locked. Ring the bell. A uniformed no-nonsense woman greets you in Czech. She does not speak English, so just do what she points to. The first thing is a cubbie with shoes; add yours to it. The next is a changing room- take the sheet she hands you and enter. Inside is a locker- remove everything, but keep your iPhone for pictures if so inclined. Take the key with you, too. She will motion for you to follow her. You will be handed a freshly poured beer as you turn the corner. 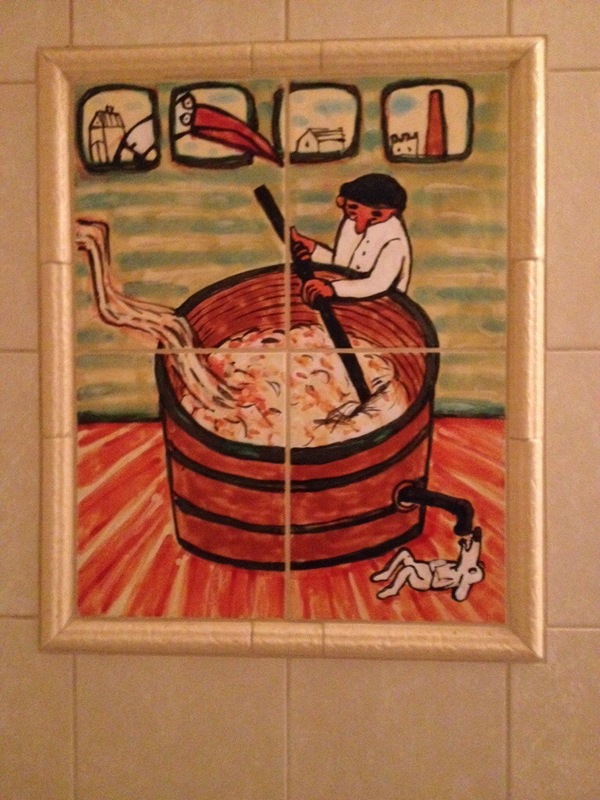 Stop in front of a tub topped with what looks like crauzen. No time to wonder- drop the cover on the chair and get in! Aaaahhhhhh. There is a place to set the beer, brewed fresh right there, within reach. Splash around a bit to enjoy the novelty, sink down, and relax. The bath is made up of warm mineral water (also bottled there) and a magic mixture of dark beer, hops, yeast- and secrets. It feels amazing. 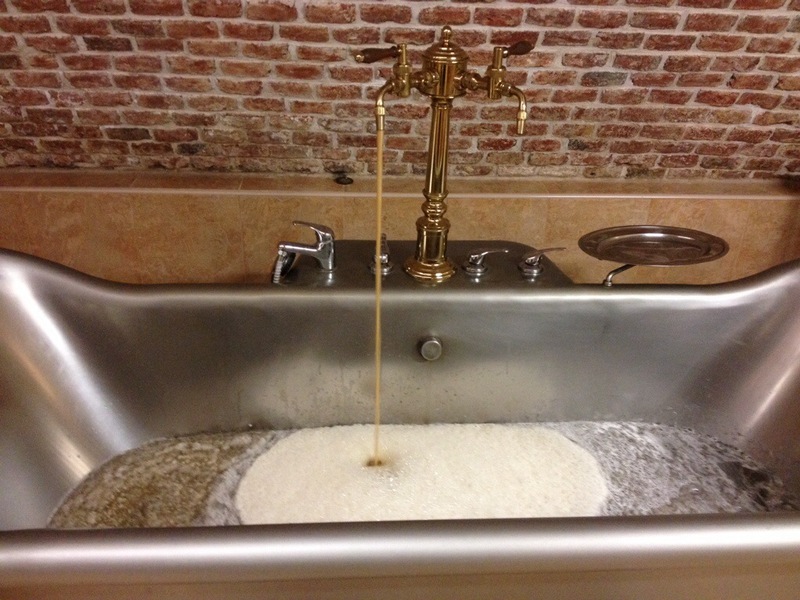 The beer addition comes out of its own faucet. Close your eyes. Interrupt your warmth only to sip your beer and experience the contrasting sensation of the cold liquid going down. Then- just as the water is about to have chilled a degree too much and your beer is gone, stern spa lady comes back. She holds up a giant white sheet, which somehow you know to get out of the tub and back in to. She leads you to another dark part of the cave- to a lounge chair lined with a towel. Sit back as she wraps the towel around you and your sheet and points to your next beer. You’ll be warm- you will doze. Ten minutes later you feel the pleasant sensation of melting, and reach for the beer. Magic. 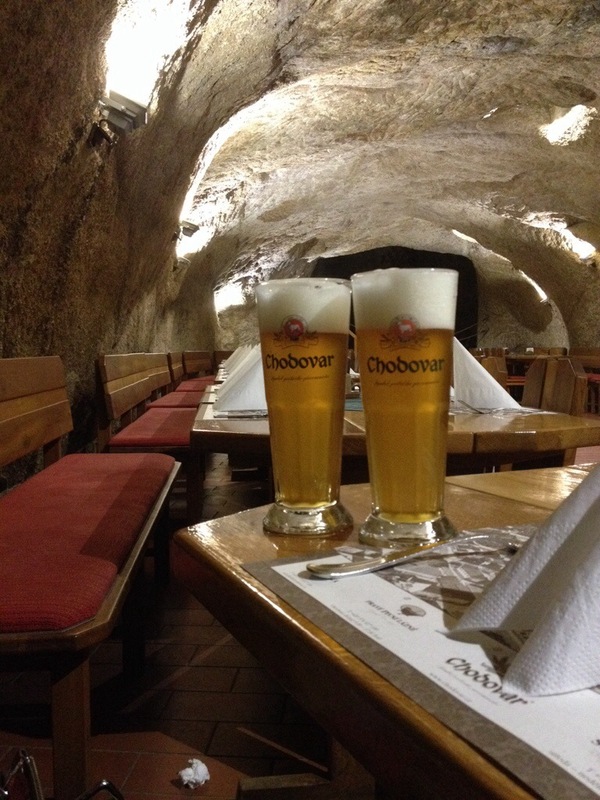 A few hours later, in the attached restaurant in a cave, order the yeast beer only available there and pulled directly from the lagering tanks. Marvel at how soft your skin is.